Get the smooth, soft, and tangle-free hair that you’ve only dreamed of! Silk Hair Salon offers keratin-infusing hair treatments that help control curls and frizziness. This simple procedure is performed by a specially trained hairdresser, and lasts up to five months. Our beautiful natural 100% Remy Hair Extensions are the perfect way to add instant glamour to your style. In just one appointment, you can have gorgeous length, luxurious volume as well as highlights and color effects. Silk Hair Salon offers Wedding and Special Events Hairstyling and make-up services for Bridal Parties, Quinceaneras, Prom’s, and every occasion where you need to look your best. Why Choose Silk Hair Salon? The beauty professionals at Silk Hair Salon of Austin are dedicated to making you look and feel your best, every time you walk through our door. We offer cuts that can be anything from flattering to striking, dazzling hair color, and expert styling to complete your look. Come relax in our comfortable beauty salon atmosphere, and let us take care of making you look your absolute best! At Silk Hair Salon, we take pride in making you look absolutely stunning! Our hairdressers are experts with everything from cuts to color to hair extensions to keratin treatments, all aimed at one goal: hair that will make you look and feel great. Our beauty salon boasts a team with over 60 years’ combined experience in the hair styling industry. That’s 60 years between just four dedicated stylists! In addition to serving the women of Austin, there is also a significant amount of formal education and training experience at Silk. The bottom line is, we know hair, and we know how to get whatever look you might be after. If you want a simple trim, you’ve got it. If you need our help to figure out a new style, color, or highlights, we have the hairdresser who knows how to get a look you’ll love. 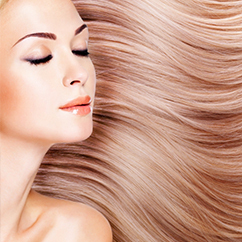 We specialize in applying hair extensions that look as natural as your own hair, and will be sure to impress. And our keratin treatments will leave your hair looking smooth, feeling soft, and positively glowing with added shine. Are you looking for a beauty salon you can trust with your hairstyle for a wedding, prom, or other formal engagement? We offer special events styling to help you look your absolute best for any occasion! At Silk Hair Salon, your beauty is our top priority. We do our work in a professional, friendly environment where you’re treated like family. For all your hair and beauty needs, Silk Hair Salon is Austin’s number one choice. Make an appointment with us today!